Day 11 – It Is True, We Are Officially In! I couldn’t be happier or more proud! Making it to the finals has most definitely been the highlight of my trip so far. Isn’t that why we are here, after all? Rumor had it, just before the semi-final gala kicked off, that Iceland would either be the first to go through, or it would simply miss out by a couple of votes. The polls across the Olympiisky Stadium walls, however, had been very promising during the week. We were placed at the very top of the list, as the most likely contender for the finalist spot. I’d be lying if I said I wasn’t confident… in fact, overly confident, particularly after hearing Yohanna’s semi-final performance in the Green Room – we were so proud! But suddenly it all turned into a real Eurovision nightmare, as the finalists were announced one by one, each flag pulled out individually from the electronic envelopes. There were 10 of them in total. 1, 2, 3, 4, it wasn’t getting any easier, although what helped was the constant reminder that the results were being disclosed in random order. But still, were we going to make it? By #9 we knew it was going to be either Belarus or Iceland – or maybe neither, as Eurovision has always been famous for being completely unpredictable! When the very last envelope was pulled out of the batch, I looked away from the screen and closed my eyes and ears. It was getting a little too intense! Would I be able to face another flag, other than our Icelandic one, when I opened my eyes? I honestly cannot recall seeing our flag on the screen and neither can I remember hearing “Iceland” or “Is It True?” as we sat holding hands in our cozy Green Room. Yet, I do remember our screams and tears once it had finally hit home – we had made it to the finals, 10 out of 18 semi final entries! I wish I could describe how it felt without sounding too cliché, but I can’t help it – it really was THAT amazing!!! What’s next for our team in the coming days? Well, a couple of top notch TV shows and exclusive interviews, which have already kicked off following our big night. And it’s going to get even bigger and all the more exciting (and perhaps even more nerve-wracking) on May 16th – the Grand Finale! Dare I make any predictions? Let’s wait and see. I’m just enjoying the moment, anticipating the unknown and making the most of this fantastic experience. Had I known it was so good, I would have made my first Eurovision attempt quite a few years ago. But I suppose it’s better to do it later than never at all! And now it’s time to face another crazy day filled with intense drama, excitement, madness and a whole load of fun! Who knows what the rest of the week has in store for us? It just keeps getting better…. And tougher, too! Day 10 – Semi Final Preparations! As we are making last minute preparations for the semi final, due to take place tonight at 11 PM Moscow time, the excitement is building up and our overall schedule is getting tighter by the minute! While most of the delegation parties are beginning to wind down (until the big night on the 16th) most of the participants are spending less time on the dance floor.Everyone is devoting all of their energy to the upcoming semi finals tonight, and on the 14th. As it happens, we are in the first group of semi finalists, hence the madness and major anticipation of the event. Although the absolute highlight is bound to be the grand finale itself, tonight is quite a big deal, too – it’s pretty much down to a fantastic performance by Yohanna (we are VERY confident!) and of course, one of the primary ingredients – LUCK. We simply MUST qualify tonight and go through to the finals, but I admit I’m a little nervous – who wouldn’t be? We all are, and if anyone says otherwise – they’re either insane or just lying! And the rules? Oh, that’s the scary part! 18 countries listed above will present one song each, including “Is It True?” representing Iceland. Nine countries will be chosen by televoting to move forward to the grand final this Saturday and the tenth spot will go to the country that placed the highest in the voting of the juries but did not qualify through televoting. Only the qualifiers will be announced during the show, and the complete results will be revealed after the final. There’s so much more I want to tell you about the last couple of days but it’s now time for me to rush over to a meeting with my publishers (and I have to sort out one of my publishers’ lost baggage – I keep forgetting I’m one of the very few Russian speakers in our delegation… if not the only one! I love it, most of the time) and I do promise to give you all the details following our semi final. It’s all just a few hours away! I’m excited, sleepless and a little nervous – but not really. So stay tuned for the results and don’t forget to Vote for Iceland! Day 6 – Back To Eurovision 2009! I have so enjoyed spending time catching up with old friends from school! I am back in my hometown, after all, so a little sightseeing is mandatory. I must look like a wide-eyed tourist, or rather an expatriate who’s been away for far too long! That said, following a much-deserved “collective” day off on Day 5, we are now fully back on ESC track, and in full gear! The highlight of the day was welcoming Christopher Neil (my executive producer and co-writer of “Is It True?”) without an ounce of exaggeration. The man is a true legend, and responsible for some of the biggest worldwide hit records, including Celine Dion, Cher, Rod Stewart, I mean, the list could go on forever! While our folks were watching some of the rehearsals for semi 2, I drove to the airport with our ESC hosts. I was finally going to meet Chris for the first time in my home town. It was a very special moment for me! This moment was brief, however. There was a minor mishap, for we soon realized that Chris had misplaced his Eurovision Pass! Since we were due at Olympiisky Stadium by 6 PM for the second Icelandic rehearsal (it was already 5:50 PM by then) our driver, Denis, took matters into his own hands. He must have broke the Guinness World Record. We got from A to B within 15 minutes, and through a manic traffic jam at that! The set looked really beautiful, and we were all impressed with the sound, especially during the playback in the viewing room. Chris, who has been to more mega-huge gigs in the last few decades than I can even imagine, told me that it’s far more professional-sounding than he had expected. 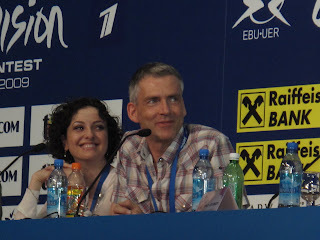 Did you know that one of the top sound engineers from Europe (who happens to be from “our neighboring” country of Sweden) is in charge of the ESC sound this year? As soon as Yohanna got on stage, she blew everyone away with her performance. Unlike most rehearsals, ours was actually one of the few that felt like the real deal. The crew and some of the press people attending clapped after every soundcheck and every take, which apparently is very unusual. After the rehearsal and our private playback (where we discussed the performance and made last minute comments about bits and pieces – mostly technical stuff) the organizers escorted us to the press conference room. There was going to be some media madness on the spot! Although today’s conference was a little shorter than Monday’s extravaganza (probably due to press representatives trying to juggle a million things at once during the pre-ESC prep time) it was really cute to hear Yohanna sing a cappella in Russian, especially for the benefit of the local press! By the time we had wrapped up at the venue, it suddenly hit us that we hadn’t eaten a thing since God knew when. So, the next stop turned out to be quite predictable, and not too exotic, either – our new favorite Italian restaurant in downtown Moscow! The best part so far, I have to admit, has been ordering food for our delegation every time we go out. Since I’m the only other Russian speaker, aside from our hosts, do I feel like a true Muscovite when I’m around them?! Although I’ve promised our musicians that I’ll take them out clubbing tomorrow night, I’m actually very limited in my knowledge of the Moscow nightlife. Aside from the restaurants, I don’t know too much about it, so it will be interesting to see if they’ll like my local Zagat choice! Tomorrow is another crazy day, or so we’ve been warned. The highlight will certainly be our Icelandic Party, to be hosted by the Icelandic Ambassador, at the Embassy here in Moscow. This is extremely exciting, as there will be a lot of singing, dancing, and probably quite a bit of drinking as well. But, I promise to behave! In all seriousness though, it should be interesting, as I’ve never really been to a purely Icelandic party. That’s quite an intriguing prospect, to say the least! I daren’t look at the time, in case it has gone past 2 or 3 AM again. So far I’ve been going to bed at or around 5 AM, at the earliest. I’ve been doing a seemingly endless amount of radio promo interviews in Europe every night, and it’s made a regular bedtime somewhat awkward, if not impossible. Of course, it’s been amazing to be able to promote both my UK single, “Thinking of Someone Else”, and the Eurovision song, “Is It True?” at the same time. But it’s also been a little hectic! Plus, I’ve got to draft the synopsis for my book sequel (which I’ve only just submitted to my agent) while I’m in Moscow. I’m not sure if I’ll be able to get some time off to party with my new Icelandic friends. Of course, you’ll be the first to know on BTR, so stay tuned! Oh, and one more thing before I turn my laptop off for the night – a major Russian TV channel, ORT 1, and the main news show, “Vremya,” are endorsing “Is It True?” They are highlighting it as one of the ESC songs with a strong Russian connection, and they are telling our compatriots to keep their eyes and ears on throughout the competition for it. So with ORT’s support, which is a huge deal over here, we shouldn’t do too badly at all! In fact, we are very optimistic, so, fingers crossed! Day 4 – Down Time, Party Time! Just when it seemed our manic schedule was going to get out of hand, with nary a moment to tour the Russian capital, the Eurovision organizers announced today and tomorrow as the second semifinal rehearsal dates. So, we’re officially off for the time being. Or at least the songwriters and a few of the delegates are, as Yohanna and her coach will still be rehearsing at the hotel over the next couple of days. While the Icelanders were cruising around Moscow in our ESC bus, sight-seeing all over the city, I decided to sleep in. I ended up relaxing for the most part of the early afternoon. The phone rang a couple of times about various interviews and organization issues. It’s embarassing, but I was so exhausted (and totally jet lagged) that I honestly couldn’t recall half of what I was saying in my sleepy state of mind, after I finally woke up! Hopefully, it’s all still very much intact. After spending a few hours with my photographer, and another few minutes on the phone with friends in New York (yes, I’m getting just a little homesick, honestly, just a little!) our Russian hosts picked me up around 7 PM. We headed over to the Il Patio restaurant downtown, where I joined the rest of our delegation for a proper catch-up and lovely Italian dinner. Although the pizza was slightly on the cold side, my mozzarella and prosciutto salad was simply delectable! Sitting right between Alma, one of the soloists in the famous Icelandic pop group Nylon (she is also Oskar Pall, my co-writer’s fiancée) and Elin, our fabulous make-up artist, we laughed so hard over dinner. Our table was split into 2’s and 3’s, and it was quite crowded, even for the restaurant staff. It took them forever to serve us! For this very reason, we arrived late to the opening of the Euro-Club in Moscow’s historic Manezh on Red Square. But it actually turned out to be the best part of the night, as what happened afterwards was so much fun! Some of the biggest Russian pop stars, including Mumiy Troll and N’Evergreen (both of whom I’ve recently interviewed and whose songs I’ve played on my Russkiy in the Mix show) performed a set each and really made it a special night for the VIP attendees. And it was just nice to hear some great Russian pop tunes, for there really aren’t THAT many! Tomorrow is going to be a rather quiet day for most of us, as we prepare for our big rehearsal on Thursday, followed by the international media conference. Just before our rehearsal kicks off, I’ll be heading off to the airport together with our hosts to meet our co-writer and my producer, Christopher Neil. I really cannot wait to show him around my home town, or one of my two home towns, anyway! In case you’re thinking I’m off to get some sleep, I’m afraid I have to tell you you’re wrong. Although it’s already 3:30 AM here in Moscow, I’ve got a phone interview coming up with a UK radio station in a few hours, so there will be no sleep for me tonight. I’m Sleepless in Moscow! Before I say goodnight, however, some quick insider info. An impressive majority of our ladies were very disappointed that Sakis Rouvas, this year’s Greek entrant at ESC, did not appear at tonight’s EuroClub show. Is it just me, or is he just too flawless not to be a model, instead of being a singer? I honestly don’t get it, but more on that later, right here on BTR!